Operating a geographically distributed model, Benchmark Senior Living faced remittance processing challenges typical to the industry. Benchmark operates a network of locally owned but centrally supported senior living facilities throughout New England. Benchmark set out in search of a Remote Deposit Capture (RDC) solution that would help them consolidate the check acceptance and payment posting process, while respecting each locally owned facility’s need for account confidentiality. ETran requires no software for each senior facility to maintain. Deployed in a Software as a Service (SaaS) model, at user logon the solution determines if a new version of the application has been published. If it has, the user’s PC is pointed to the latest version of ETran. ETran’s configurable facility and user-level access permissions and flexible data structure capabilities allow for customized data access and workflows at the individual user, facility and corporate levels. from a new resident takes place automatically. 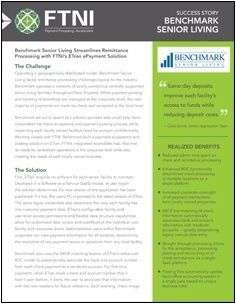 Almost immediately upon implementation, Benchmark was able to realize decreased payment processing time frames, as well as increased cash flow as a result of same day deposits facilitated via the ETran RDC Module.